Posted On June 16, 2015 by Team iCynosure. Every time I meet someone new and tell them I’m a mother of a 3 year young princess they just refuse to believe it. I have to prove that I’m a mom with pictures and sometimes even a phone call to my little #PrincessHeer. I more or less know where the conversation would be headed to.... ‘Oh you must surely be working out so much’. But to be honest I have not hit the gym in my entire life; forget during the post pregnancy craze. Fortunately I do have a pretty good metabolism along with a highly intelligent momma. She has always made sure to drill into me the connection between how I look / feel and what I eat every day. She has a simple mantra for feeling and looking gorgeous; cook and eat the food that is right for your overall health. A balanced diet is our home doctor’s prescription for beautiful skin, a toned body and an energetic lifestyle. Over the years my mom has ensured I have foods that may not tantalize my taste buds by scaring me of discoloration, sagging skin and dark circles. I’ve realised that beauty on the outside is the result of what’s going inside which is a direct reflection of the lifestyle choices I make. I’ve seen my mom toil in the kitchen day-in-day-out to lay a spread on the table that is not only tasty but also nutritious and healthy. The only thing that she always insisted is to have home-cooked meals. Since the time I’ve taken over the kitchen at home I’ve realised the importance of home-made food. But what I’ve discovered is that some routines live with us through generations. 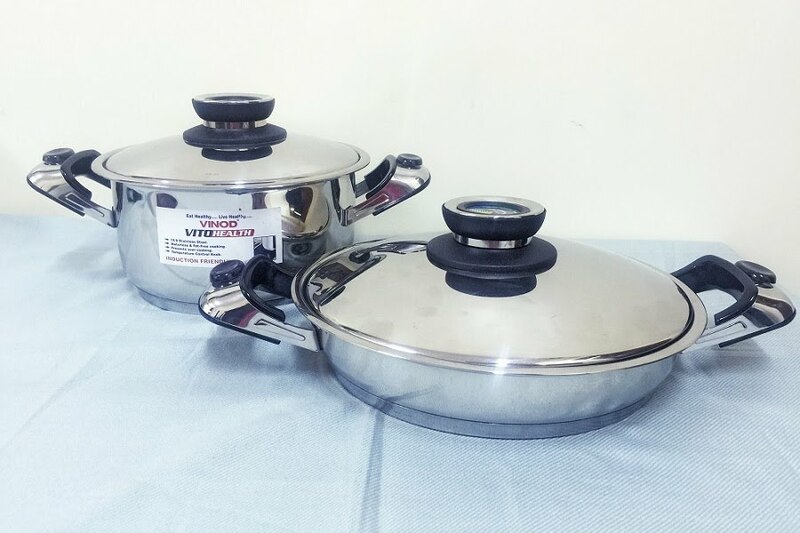 I so clearly remember how our kitchen was equipped with multi-layered sandwich bottom cookware from a brand called Vinod Cookware. Every time we went out to shop, mom surely stopped by our local utensil vendor to check on new products from the brand and as and when needed she added to the arsenal. Vinod Cookware is one of the most accepted and well-loved cookware name that offers an extensive portfolio. 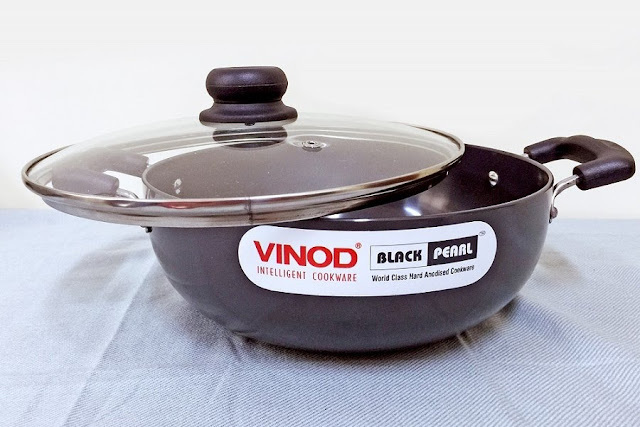 Vinod’s range has expanded to also include state-of-the-art cooking technologies such as non-stick cookware, hard anodised cookware and more. It’s also the first to introduce the concept of sandwich bottoms in pressure cookers, and has consistently innovated and refined its product range to offer the best solutions to the Indian Kitchens. Additional to the regular product range Vinod Cookware also extends to the Health range with the very popular “VitoHealth” designed for the health conscious needs of Indian consumers. That’s the habit I’ve inculcated from her. The only difference is that the cookware in my kitchen is very different from what she had in hers. Luckily for me, the brand has designed advanced cookware to meet the needs of the urban kitchen and built a range of products that are not only perfectly multi-tasking but also stylish and glamorous. As new technologies are introduced in all spheres of life, advancement in the healthy cooking department takes center stage. There has been a buzz in the market about water-less and oil free compatible cookware that disperses heat uniformly cooking food evenly and perfectly without adding water and oil. So now you know what you need to do. Spend less time in the gym, get into the kitchen and cook healthy meals using the new impressive #VitoHealth #SignatureCookware to stay fit. I really like to follow your blog, your articles are amazing! Kisses.